A campaigner has called on council chiefs to consider saving a doomed £24million school from closure – by demolishing a community centre and switching its services. Outspoken Colin Campbell believes flattening Chuter Ede Community Association could solve the problem of what to do with South Shields School, which is due to close next year. Mr Campbell, of Cleadon Meadows, Cleadon, says this would satisfy the terms of the Private Finance Initiative (PFI) funding deal under which the school opened in September 2011. The contract states the under-performing school, which councillors last week voted to close in 2020, can only be used for educational purposes, limiting future operational opportunities – and costing the council millions of pounds in repayments. The housing landlord said: “This is the perfect solution and the ideal way of saving South Shields School. “Chuter Ede needs some repairs and an upgrade – closing it and moving the work it does to the school is a good idea. “It sits on a considerable amount of land, which could be built on, raising much-needed revenue for the council. “As far as I know, the council owns the land, meaning it would benefit from all the money that would come from housing. 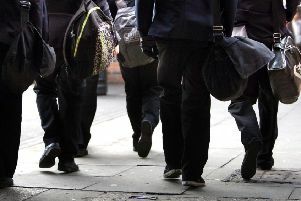 The school’s difficulties stem from an ‘inadequate’ rating by education standards inspectorate Ofsted and a failure to find a backer to sponsor it as an academy. It also has capacity for 850 pupils yet has only about 550 filled places. Members of the council’s Cabinet committee voted for its closure at a meeting last Wednesday, a move which angered campaigners who wanted it to remain open. In response to Mr Campbell’s proposal, a council spokesman said: “We understand how difficult the consultation on closure has been for the students and their parents and carers. “The education of our young people remains a core priority for the council. We are absolutely committed to supporting the entire school community and the focus now is on making sure the transition to alternative schools is as smooth as possible.